Main application: this aircraft is suitable in each kind contains filling the chocolate special purpose equipment, it may pour the single color. 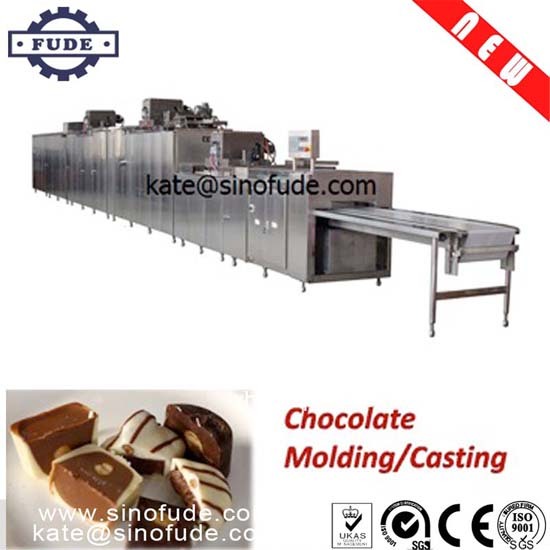 Contains filling the chocolate and the broken kernel contains filling the chocolate: The collection baking the mould, casting, vibrating mould, cooling, conveying in body's multi-purpose casting machines. This machine has the quantitative precision (each piston rod are used import seal, each are inlaid stainless steel piston set outside the rod), photoelectric control casting, electrical heating mode, automatic climate control, hot water circulation. It is suitable for the factory which has many varieties and large production capacity. All parts contact with food are made by stainless steel 304 or food grade PU belt, machine frame shrouding with stainless steel 201.